Tax bill corruption in one chart. The wages of the average American worker haven’t budged since last year. That’s the truth Donald Trump doesn’t want you to hear. But no matter how loudly he and his loyalists in Congress shout their lies, the data is clear. The forgotten men and women whom Trump promised to help are being robbed blind. It didn’t end with the tax scam either. As the updated CAP tracker illustrates, Trump’s Administration has instituted a 43-pronged assault on American workers, ranging from undermining unions to rolling back child labor laws. As just one example, every day working people are missing out on higher wages because Trump abandoned overtime protections initiated under President Obama—almost a billion dollars already. 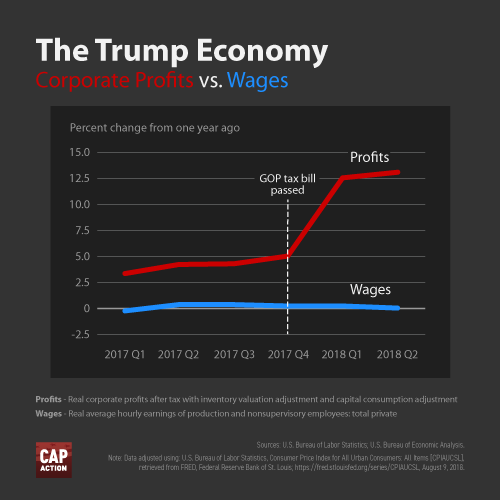 CAP Action is tracking all the ways Trump’s policies are hurting American workers. Click here for more. PUERTO RICO TRAGEDY FINALLY ACKNOWLEDGED. After nearly a year, the Puerto Rican government increased the official death toll in the aftermath of Hurricane Maria to 2,975. The new death toll came in response to a new study from George Washington University and is 46 times higher than the previous official count of 64 people from December 2017. The Trump administration’s response to Hurricane Maria, as we detailed in previous editions of the Progress Report, was disgustingly inadequate, especially when compared to the response to Hurricane Harvey in Texas. A team of CAP staff recently visited Puerto Rico and witnessed prolonged suffering and ongoing structural, public policy and economic challenges in the wake of Maria.